Francis Bacon drawings and new paintings by Darren Coffield. Despite an age difference of sixty years, their paths crossed when they met in the infamous Colony Room Club, in London’s Soho. In 1949 Bacon was retained by its founder Muriel Belcher to bring in paying customers, and frequented the club until his death in 1992. Coffield belonged to a new generation who beat a path to the Colony in search of Bacon, and made it their home in the late ‘80s. Coffield met Bacon and his close friend and sole heir John Edwards there and is currently completing his next book on the Colony Room Club. 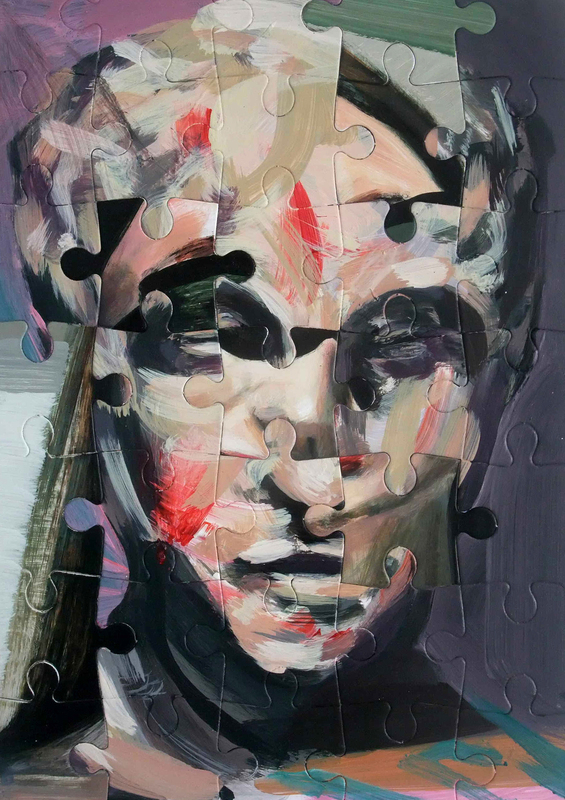 Both artists do figuration with a twist: Bacon’s reinterpretations of the human form are some of the most ground breaking and influential images of the twentieth century, while Coffield’s equally disturbing images evolve from painstaking and logical pursuits to non-predetermined ends, becoming paradoxical puzzles playing with perception. The eight pencil & graphite drawings and two pastel collages by Bacon were made between 1977 and 1992 and donated to his good friend in Italy, Cristiano Lovatelli Ravarino. The subjects are often related to the themes of some of Bacon’s most iconic paintings, such as his crucifixions and those after Velazquez's Portrait of Pope Innocent X. 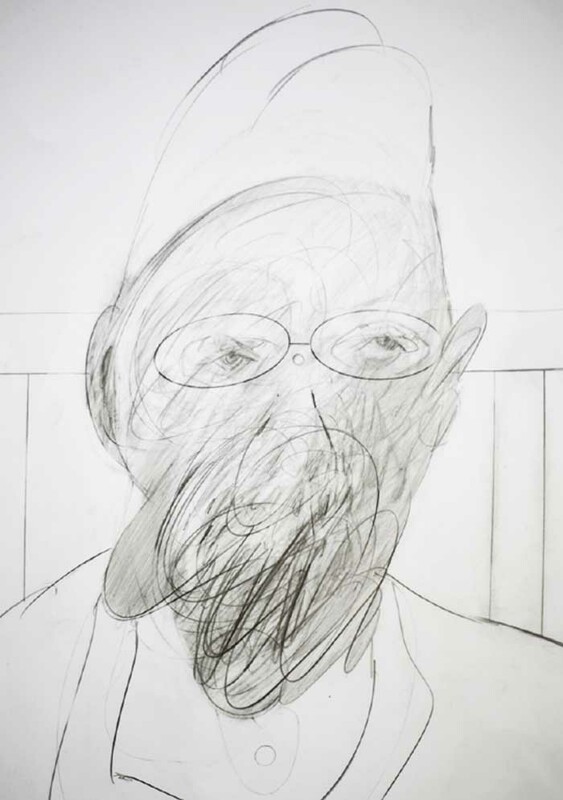 The large-scale pencil & graphite drawings on Fabriano paper, mostly 100x70cm, feature distraught faces and distorted bodies in spatial frameworks typical of Bacon’s oeuvre. Drawings by Francis Bacon from the Francis Bacon Collection have been exhibited extensively around the world, including the Kaoshing Museum of Fine Arts in Taiwan; the Municipal Art Gallery, Ferrara, Italy and the Centro Cultural, Buenos Aires, Argentina. Bacon and Coffield are also linked through David Sylvester who was a fan of the younger artist, describing him as: “Another of those magicians who (probably without knowing) know how to imbue pieces of matter with light”. Coffield has an interest in the field of human cognition. His work deals with how we perceive and process the world around us and subverts the viewer’s instinctive faculties for reading the apparently familiar to create stimulating and provocative paintings. In Coffield’s new series of paintings the images are first painted then broken up and dispersed in to one another. All the information is contained in the painting but not necessarily displayed in the expected cognitive order. The information is consumed and resolved; creating a new form that can be read in terms of creation, consumption or corruption. It provides a basis for approaching difficult questions such as the relation of knowledge to perception, and ‘reality’ to appearance. With this process the final artwork is cannibalised, made by the painting ‘feeding’ off itself, as he believes nothing can be more abstract than what we actually see. Complementing the exhibition are five stunning black and white photographs of Bacon taken by award winning photographer Neil Libbert in the 1980s.